Built for small loads and exceptional vertical elevation change, the narrow track spiral conveyor saves floor space by using overhead space instead. 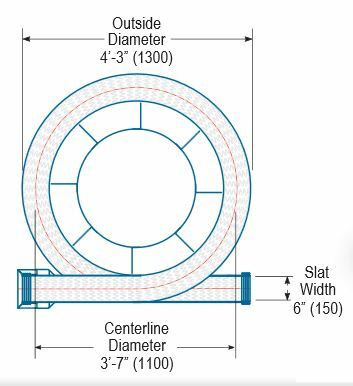 This super compact model has a maximum centerline diameter of 3 feet 7 inches for tight spaces in pharmaceutical, nutraceutical, person care and food product environments. A great fit for the small package market, this vertical conveyor with 6" wide nesting slats can end-transfer small cartons and packages, or side-transfer small bottles and containers in single file or in mass at speeds up to 200fpm. Proprietary Ryson design features include a low friction chain slat arrangement for high speeds, high capacity, low energy use, low maintenance, and long service life. Only one drive motor is needed, offering significant savings in energy, controls and systems integration. Six inch wide nesting slats provide a flat, smooth conveying surface for both end-transfer and side-transfer use. Optional friction inserts may be added for more grip during conveyance. Additional features include an automatic chain tensioner and built-in overload protection device. The narrow track spiral conveyor installs easily since it ships assembled and has been shop tested before shipment, saving time and install labor costs. 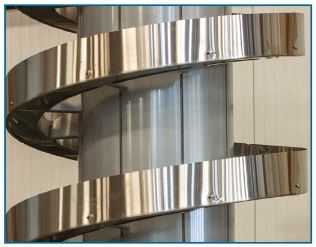 Only high quality components are used in Ryson spiral conveyors to reduce downtime and extend service life. Bearings are pre-lubed and sealed, needing no further lubrication. The heavy duty nickel plated chain needs occasional lubrication and conveyor slats are maintenance free. When worn beyond usefulness, replace as single components with no need for special tools. 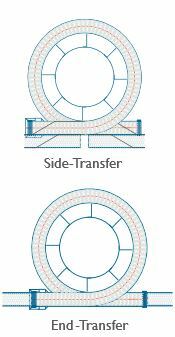 Because of modular design elements, the narrow track spiral conveyor is easy to configure and customize. Each one is built to order and is based on one of 4 basic configurations of the in and out feed tangent locations (A, B, C, and D). Special tangent angles can also be customized for special needs (B-MA for example). All configurations operate in up or down mode and rotate in clockwise or counterclockwise directions. 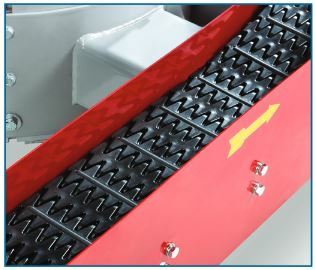 Every spiral conveyor includes an inverter duty gear motor and two proximity switches (one to sense chain tension and one to protect against overload). Pre-wiring and control options are available, but most times this type conveyor is integrated into the existing conveyor controls system. Proper integration assures optimum performance.